guacamole is, hands-down, one of my favorite dishes. while it is perfectly satisfying (+ addictive) simply accompanied by tortilla chips, i also love it when it’s paired with fresh grilled chicken or fish. while standard guacamole is undoubtedly delicious, i’m always on the lookout for a guacamole recipe that has interesting, unexpected flavors or textures. 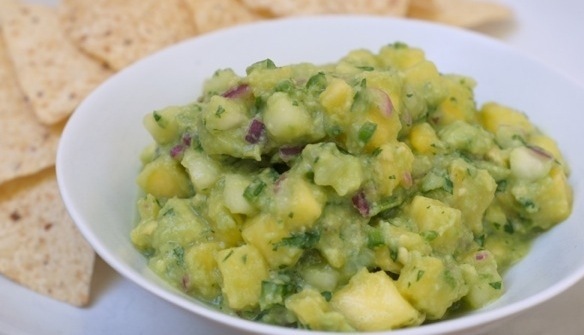 when i saw the recipe for this pineapple + cucumber guacamole, i was intrigued. fruit in guacamole? i had never tried anything like it, but the flavor combinations were definitely interesting + had the potential to be amazing. let me tell you, this guacamole far exceeded my expectations. the pineapple adds a wonderful, bright acidity that cuts through the richness of the avocado, while the cucumber adds a fresh texture + flavor. this is intended to be chunkier than your average guacamole, but if you prefer a smoother texture, a few pulses in a food processor or even a couple strong mashes with a potato masher will give you a more uniform texture, while still preserving the wonderful flavors. for the full recipe + a review of the cookbook it came from, truly mexican: essential recipes and techniques for authentic mexican cooking, hop over to cooks + books + recipes, where i’m guest posting today! + definitely give this guacamole a try – i promise, you will not be disappointed! I’m gonna have to hop over and check this recipe out. We are huge quac fans (we eat avocados 2 or 3 times a week… addicted!). I’d never think to add pineapple but it sounds intriguing. Will try next time! chris, i wasn’t sure how the pineapple would work, but it was a fabulous addition! it’s great with just chips, although last night i served it with cuban pulled pork + jasmine rice/black beans with tomatoes + chiles – it was the perfect complement to that meal! I’m a totally digging this! I love, love, love guacamole and pineapple. Never would have thought to put them together. Speaking of fabulous guac, have you had it at Tavern? They make it with goat cheese & pistachios…heaven! if you like ’em both, you have to try ’em together! i was super impressed by the results. no, i haven’t tried the guac yet at tavern — i always default to the burger. =) i’ll definitely give it a try next time – it sounds amazing! Oh my. I’ve had mango in my guacamole but never pineapple or even cucumber. But i love it! And I’m one of those people that likes a chunkier guac. For some reason it just tastes (and looks) fresher. I may have to add this lovely recipe to my Gameday tailgate menus…. Thanks Miss Amy!! If you like chunkier guacamoles + fresh flavors, you are going to loooove this. Hope it makes one of your gameday tailgate menus – that would be too fun! Wow, this looks amazing! I’d never considered pineapple or cucumber in guacamole…but after seeing this, I’ll definitely be giving it a try! I love “chunkier” dips, and this looks like a fabulous one. Perfect accompaniment for my favorite main dishes–Mexican food! i thought of you when i was writing up the post because i know you love your mexican food! i highly recommend this guac, which says a lot, as i can be picky about ’em. i like them slightly chunkier, too, so it was perfect in my book! You’d better believe I’ll be making it for my next Mexican meal (um, maybe tomorrow, it’s been a few days already). Very interesting recipe. I would have never thought of pineapple in quacamole. I do like a chunky style guacamole and next time I’ll give this a try. Amazing!!! Such a perfect holiday weekend treat! Good thing you put in the “highly addictive” warning, because it is!! i’m so glad you liked it. 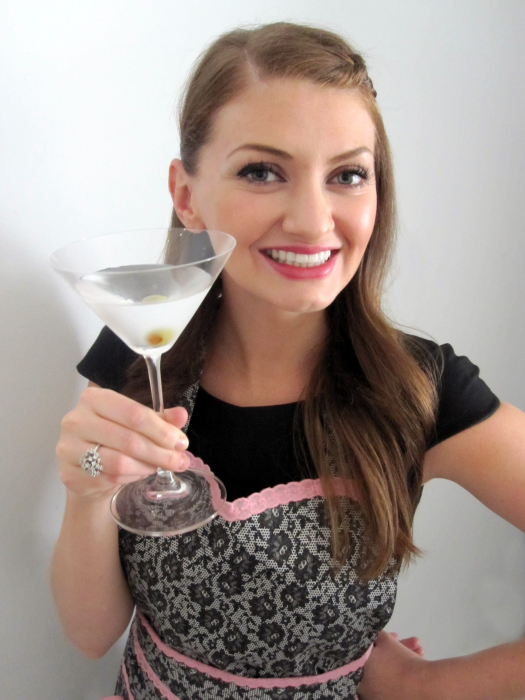 thank you sooo much for always being a willing taste-tester for me – you have no idea how helpful it is for me! Mmm…I will take guacamole in any way, shape or form. Can’t wait to try this out, and check out your review of the cookbook as well! definitely check out the cookbook review – there are some amazing recipes + it has some of the most gorgeous pics i’ve ever seen in a cookbook! I love adding chopped mango to homemade guac..haven’t thought of pineapple before but I love pineapple so sign me up! So creative- I’ve never had any sweet in my guac before! i hadn’t either but i absolutely loved it (+ i’m not even a huge sweet tooth-type person). the combo of sweet, rich, crisp + fresh flavors is just amazing! Oh I’m loving this – what a creative dish! isn’t it fun? i loved the creative combination of flavors, too. i had never tried it either, marina, but i thought it was amazing. i’d iove to hear what you think of it if you give it a try! Chris is such a fan of the sample you brought to us, he had to make a late night run last night to the grocery store for more tortilla chips to dip with!! Next post: hot dog sugar cookies – perfect for labor day cookouts!